This 19th Century Italianate brick row house, located in Ft Greene, Brooklyn, was in a state of extreme disrepair. The four-story house was stripped down to its brick shell and re-built with a 400 square foot, full width, two story rear extension for a young, growing family. 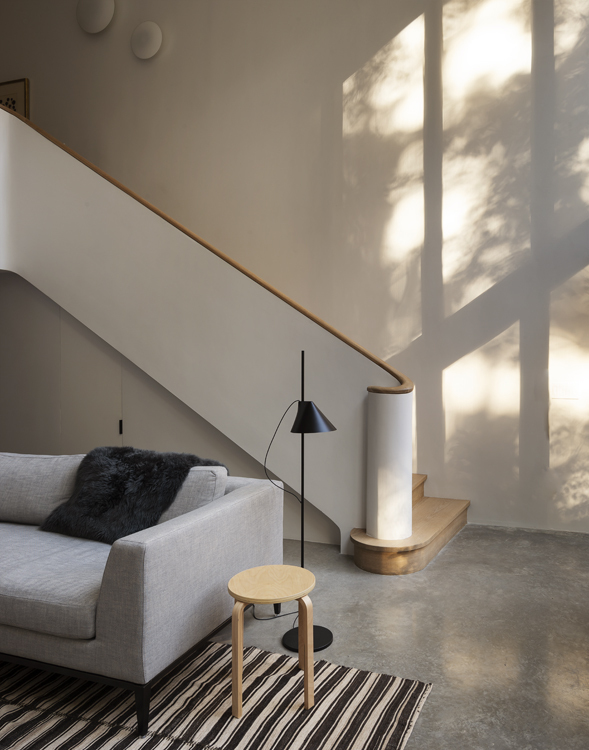 The clients were interested in maintaining the historic character of the street façade but completely recreating the interior environment with a humanist approach to modernism. They requested the house feel like “a jewel in a cardboard box”. With almost no surviving original detail, the house was a blank canvas and allowed not only for new finishes but for new connections between levels. The new double height rear extension, occupied by the Living Room, connects the Parlor Floor Kitchen to the Garden Level Family Room, and frames the view to the landscaped rear yard through full height glazing. A new wood burning fireplace anchors the Living Room. Finishes throughout were selected to complement the owner’s interest in creating a warm, modern environment. The floors are white oak finished for a natural appearance. The walls and various curves are plastered smooth and coated with matte paint to enhance the effect of sunlight and shadows on the various surfaces. 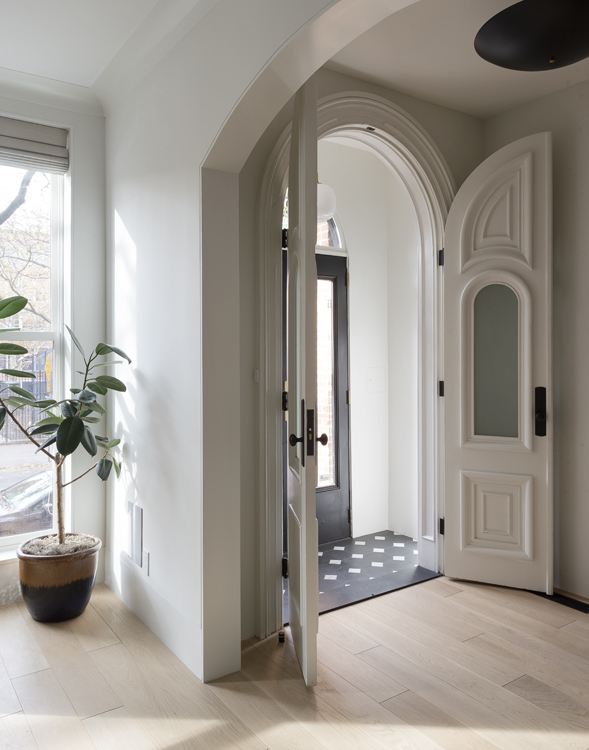 Throughout the “Parlor Floor”, arched openings and high baseboards reference the historic townhouse character but are reinterpreted with minimalist, modern detailing. This floor contains the dining room and the kitchen as well as a small powder room. The kitchen was custom designed and built and features a dark sculptural metal clad island topped with Paperstone. The wall cabinets are bleached oak and topped with an off-white Lapitec. The entire second floor is designed as a Master Suite and includes a roof deck over the new extension. The oak flooring continues into the spa like master bathroom. 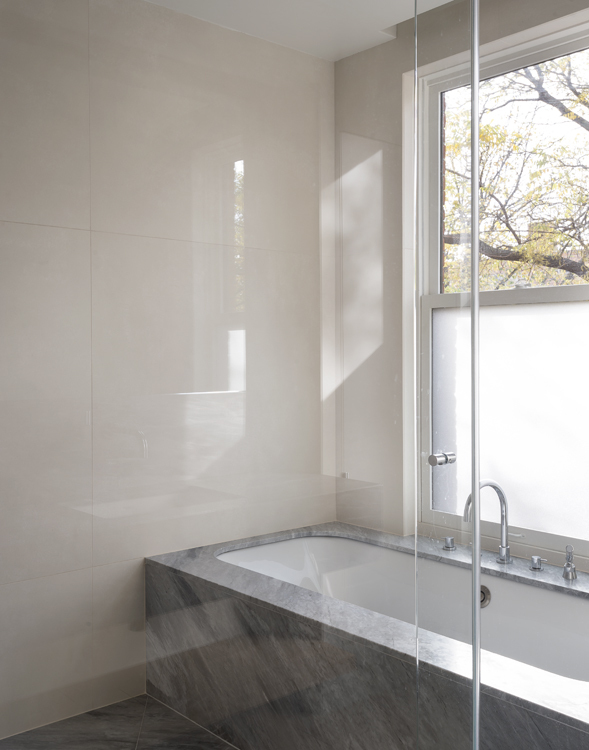 Contributing to the soothing color palette, the shower and vanity are cut from large gray marble slabs and the shower walls are in a large format porcelain tile. The third floor contains a guest bedroom and children’s room, both ensuite. They are connected by a sky lit play room located at the top of the stairs.